Youth Villages hosted their 30th Annual Soup Sunday at the FedEx Forum on Sunday. This year's special guest was Memphis Tigers men's basketball head coach Penny Hardaway, who welcomed attendees and rang the traditional kite-shaped dinner bells to get the event started. Soup Sunday gives Mid-Southerners a chance to sample delicious treats from 50 of the best area restaurants and caterers. More than 2,000 people came out to help raise money for the Youth Villages' Chris Crye mentoring program. “If you have one person in your life sometimes that believes in you and sees things in you that you don’t see in yourself and is willing to spend time with you it can make a tremendous difference in your life,” said Richard Shaw, Youth Villages Chief Development Officer. Big Bluff City food staples like Huey’s, Half Shell, and Mosa Asian Bistro were just a few of the places people could choose from for soup options. 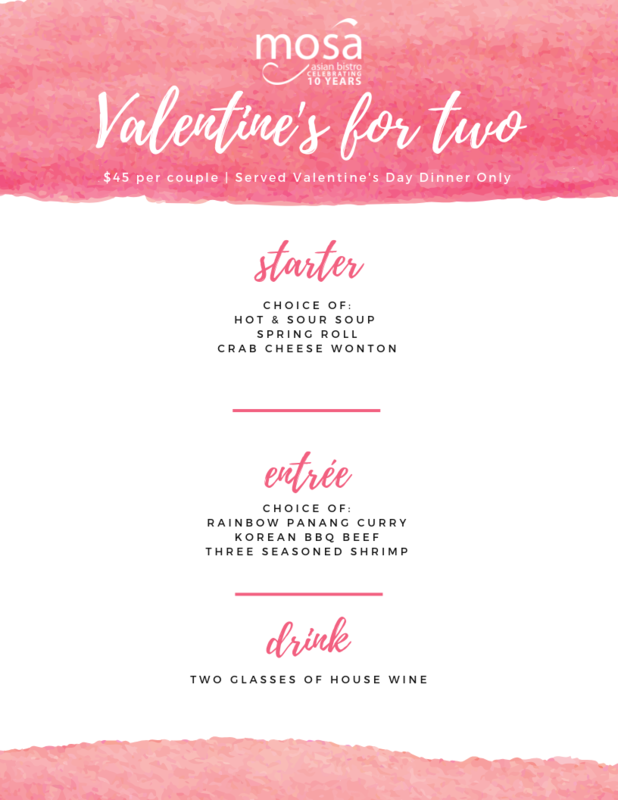 Join us for a romantic Valentine's Day Dinner for Two! Join us on Valentine's Day for a romantic dinner special! We are accepting reservations at (901) 683-8889. Youth Villages will host its annual Soup Sunday tasting event Feb. 17 at FedExForum. This year marks the 30th anniversary for this beloved fundraiser. Pulling out all the stops for the celebration, organizers expect close to 3,000 guests and have about 60 restaurants and caterers lined up to prepare soup and much more. Celtic Crossing is among the restaurants participating this year. It is Celtic Crossing's fourth year to take part. Each restaurant is asked to bring 30 gallons of soup. Miller estimates it will take him three to four days to make such a large quantity. Some of the most popular restaurants and caterers in Memphis participate in the event, which has raised nearly $1 million since it started in February 1990. Each participant brings a soup, and most bring another specialty such as an appetizer, side or dessert. 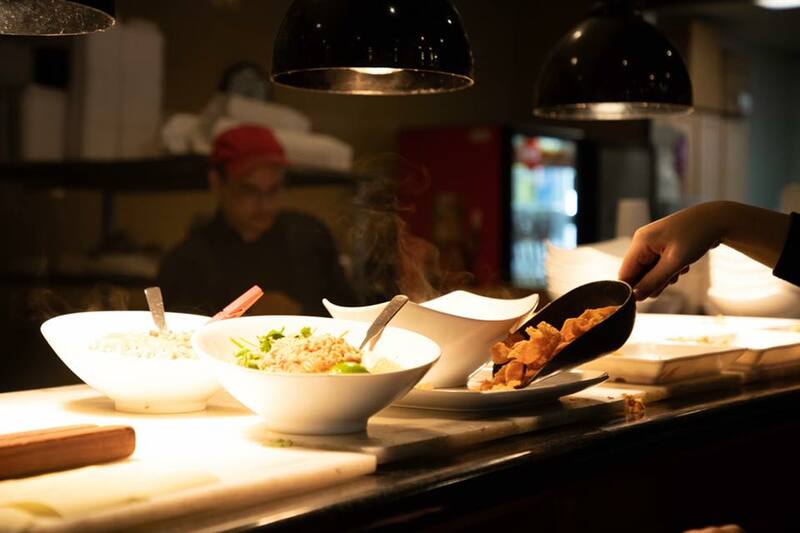 “Restaurants like The Half Shell, Huey’s, Hog Wild BBQ Catering, Mosa Asian Bistro, Stone Soup Cafe and Rizzo’s participate year after year,” said Amanda Mullen, development coordinator with Youth Villages. New in 2019 will be Strano by Chef Josh, The Capital Grille and Forest Hill Grill. The logistics of feeding warm soup and other fare from 60 businesses to a crowd of thousands are pretty staggering. Tom Cassidy III has been leading the charge for almost the entire history of the event. Soup Sunday was started by Danny Sumrall of The Half Shell and Mike Warr, a Youth Villages board member. The friends had seen a similar event in Little Rock, Arkansas, and thought it would be a great way for the Memphis community to visit several restaurants at once. With just a handful of restaurants, the first event was held at the old Captain Bilbo’s in Downtown Memphis. Little did they know how the event would grow to what it is today. “We decided to try a day family event with the first event taking place at Captain Bilbo’s,” Sumrall said. “After our second year, we knew our space wasn’t large enough to accommodate the crowds so Soup Sunday has had several homes — including Woodland Hills Country Club and the Pyramid — and presently takes place at FedExForum. The main event occurs in the concourse area of FedExForum, wrapping around the entire venue. A VIP area is upstairs in the Draft Room. The event is designed to be a family affair, with a kids zone offering activities such as Oreo stacking contests, magic shows by Magic Mr. Nick, face painting and balloon animals. General admission for adults is $20; children ages 6-12 are $10; and ages 5 and under are free. VIP Souper Party tickets are $75 for adults and $30 for children. VIP Souper Party tickets for couples are available exclusively at soupsunday.org for $110. For more information and to purchase tickets, visit soupsunday.org. Bring in the (Chinese) New Year with Good Luck! Bring in the New Year with good luck! Get a small plate of these yummy Chinese New Year traditions for just $6 with purchase of entree February 8+9. Available for lunch and dinner (dine in only). Happy new year! No, I am not a month late — Tuesday is the Chinese New Year. The Chinese New Year is all about new beginnings and fresh starts. This holiday, often called Spring Festival, has more than 4,000 years of history and is the longest holiday of the year for China. The date is based on the lunar calendar. In China, festivities begin the evening before the new year and last until the Lantern Festival, which is held on the 15th day of the year. In Chinese astrology, each year is represented by a different animal — 2019 is the Year of the Pig, which is predicted to be a lucky year. The pig represents diligence, kindness and generosity. Food is a big part of the celebration, with many dishes symbolizing good fortune and other such wishes for the coming year. 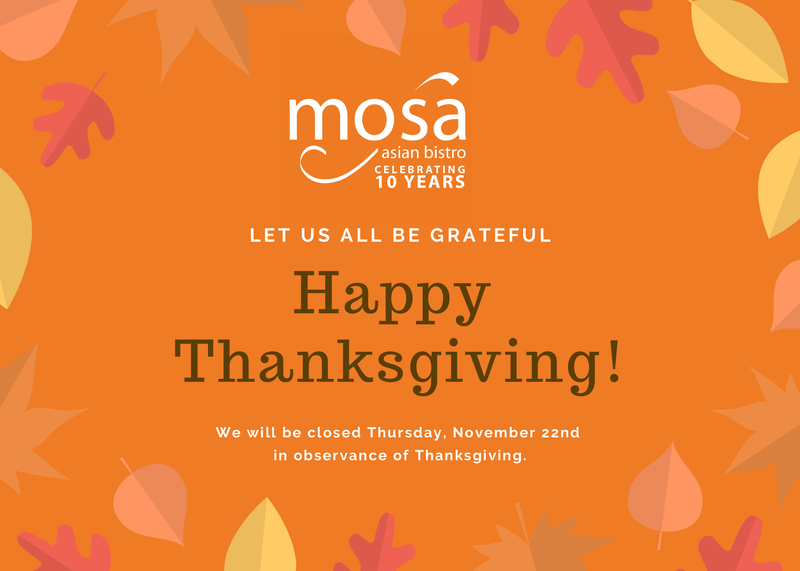 To learn more about the holiday and its traditions, I called Eddie Pao, the chef and owner of Mosa Asian Bistro. 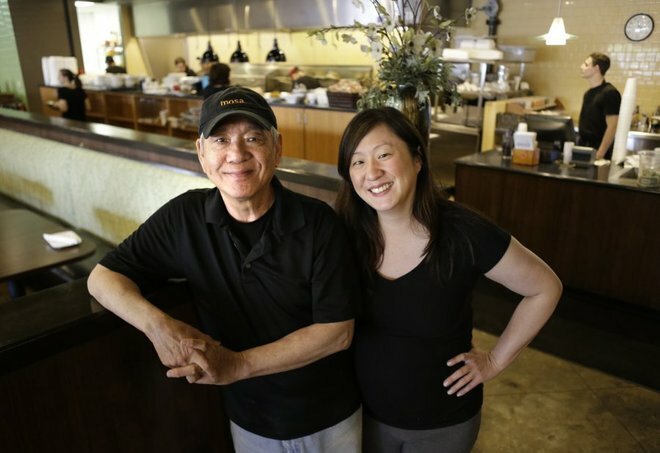 He runs his Asian fusion East Memphis restaurant with his daughter, Michelle Pao Levine. Pao grew up in Taipei and has fond memories of celebrating the Chinese New Year in his home country of Taiwan. For the celebration, Chinese families go from house to house, enjoying big spreads of symbolic dishes. There are four dishes that were his favorites, and he plans to serve a few of them as specials the weekend of Feb. 8-9. A dish called “The Perfect Ten” is one of his favorites of the holiday season, and was served every year by his family. Pao said it is a labor-intensive dish, with each ingredient being thinly sliced into julienne strips. He also said it’s a beautiful dish, thanks to all the colors. Also on his Chinese New Year menu are crispy spring rolls. Pao adds sprouts to the filling because they signify new growth and new life. A “Jiao” curry dumpling is also planned. Levine plans to make this savory beef pastry. “The significance of a food that is round or moon-shaped is that it represents the circle of life,” she said. For a sweet treat, Pao also plans to make a dish that in Mandarin is called Nian Gao. It’s a sticky rice cake. Like most Chinese words, gao has several meanings, one being “tall.” Eating one of these treats is a wish to be successful and to live “higher” each year. If you can’t stop by Mosa for one of its Chinese New Year specials, you can still enjoy a little luck for the new year. “Noodles represent long life, and oranges are eaten at the end of a meal to sweeten your life,” Levine said. There's never been a better time to check out the Memphis restaurant scene. We’re seeing Downtown become an established culinary destination with the opening of a great food hall and continued growth in all sectors. Crosstown Concourse continues to bring us new and exciting dining options, and its momentum is reinvigorating old neighborhoods like Madison Heights. From fine dining and soul food to the diner of your dreams, Memphis is making it happen in big ways. And of course we didn't forget our insider knowledge of barbecue and chicken wing spots. Here are the best spots that opened in 2018, along with some of our tried and true favorites. 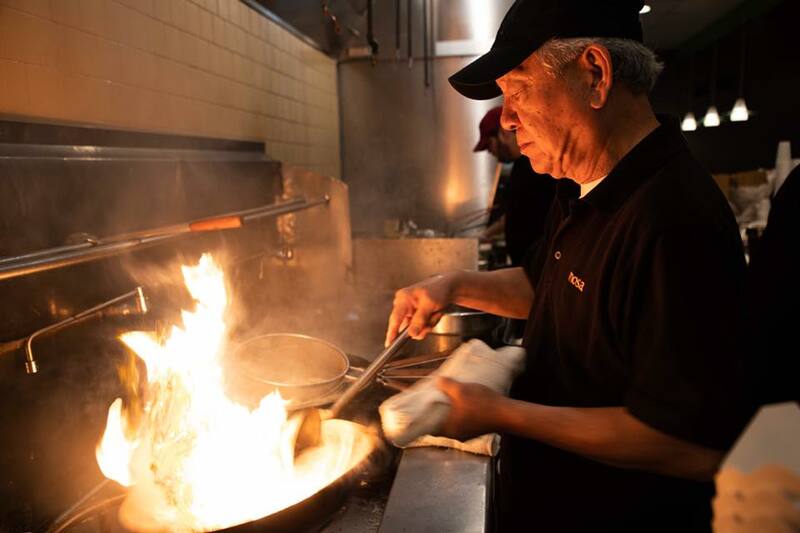 Eddie Pao, who has been in the restaurant business for 40 years and is known as the “Godfather of Chinese Food” can be found in the kitchen of Mosa, which he owns with his daughter, Michelle Pao-Levine. Eddie’s first restaurant, Formosa, opened in 1978 on Summer Avenue (and is now closed). Mosa is like its more sophisticated sister, and has a more elegant atmosphere and refined menu. Eddie’s Rainbow Panang Curry is definitely bucket list material. Ali and Chef Brandi pose for a quick photo before eating the smokehouse waffle half. the full nelson: Cheap Eats goes Paleo!! If someone would have told me that Cheap Eats Memphis was going to start the day with a paleo friendly breakfast, I would have pinched myself so I could wake up from the healthy daydream. But the dream ended up becoming my breakfast reality. For the record, the paleo diet means you eat whole and unprocessed foods like vegetables, fruits, nuts and meats. When it comes to havin’ bbq for breakfast on a waffle, the kicker becomes finding the right substitutions for sugars, processed flour and the like. Good thing Chef and Owner Brandi Marter studied chemistry in college, and knows how to mix whey protein powder, almond flour, arrowroot starch along with coconut oil and a couple more ingredients into a paleo friendly waffle batter. Wondering how she pulls off a barbecue sauce without refined sugar? Try honey and molasses. Wondering how I got this niche meaty ladened waffle for $6.50? I ordered the half, which was plenty. My days of going to the school cafeteria were not particularly memorable. Perhaps I should have had Chef Kaia Brewer as my lunch lady. If I did, then I would have most likely been dreaming of the 3rd Period Smoking Bird sandwich by the end of 1st period. I mean, how can you not start thinking about the trifecta of chicken, duck and turkey gracing two huge slices of Texas Toast, as soon as your cereal digests? Granted, my school lunches may not have set me back $11 but my school lunches also didn’t come with house made potato chips. Not only is this a bonafide Cheap Eats Memphis find, but it’s a chance at redemption for all those weak school lunches you ate off a tray. And it’s all thanks to Chef Kaia Brewer: the ultimate lunch lady. I grew up in St. Louis but sadly not on the tradition of the gooey butter cake. Thankfully I rectified this malaise in adulthood. For the record, gooey butter cake is a dense rich cake, primarily composed of flour, butter, sugar and eggs; a concoction hailing from St. Louis, MO. Now how did this treat from St. Louis end up in Memphis and in cookie form? I place the blame squarely on Bill Kloos, owner of Frost Bake Shop. Bill moved down to Memphis from St. Louis a few years back and started a wholesale baking operation that spawned Frost Bake Shop as well as a distribution deal with Williams-Sonoma. In Bill’s capable hands, the classic cake recipe shifted into cookie form. At a buck and a quarter each, it goes without saying that this is no doubt a solid snack for Cheap Eats Memphis. Butter, cream cheese, eggs and vanilla are folded into the cookie dough, which gets spiked accordingly with chocolate and strawberry, if you choose those flavored versions of the basic gooey butter cookie. They are all good, but my fav is the classic gooey butter cookie. Lately I have been appreciative of the power of a butter driven sweet. Looking back at the success of Frost Bake Shop, I’m sure Chef Bill Kloos would concur. Mosa Asian Bistro bills itself as an Asian fusion restaurant, which at the surface seems like an accurate assessment. When you look at Chef Eddie Poa’s long and storied career as a chef in Memphis, you realize Mosa is more a reflection of Memphis coming to terms with the variety and range of cuisine from the Asian continent. His Rainbow Panang curry is a perfect example. Eddie applies a batter to the chicken as if he was making Orange chicken, the Chinese American classic. Then he drops it into a Panang sauce, which is a Thai dish. The application of Thai and Chinese cooking is certainly fusion, but its also something more. Eddie would explain to me that this is a way for him to cook food that will have appeal to his older and newer customers. The older customers will certainly be familiar with Chinese cooking, as for many years Chinese food was the #1 “ethnic” food in America. The newer generation of customers however will want more variety, coming into Mosa with a appetite that stretches from Kimchi to Kung Pao Chicken and beyond. Seldom have I encountered a dish that seems like it was the product of a food truck concept, when in reality is a history of cooking Asian food in a medium sized city in the South. Now that’s something I would pay $12 for and a great way to end Cheap Eats Memphis. And that was all she wrote for Cheap Eats Memphis! Four memorable meals and I had just enough change to get me a pair of blue suede shoes. Well, I didn’t have that much left over. And I guess all the blue I need are the specs on my face. On second thought, I’ll just take my change and get another butter cookie. Until next time my friends . . . Stay Thrifty! Eddie Pao of Mosa Asian Bistro will be featured on Cooking Channel’s “Cheap Eats”Wednesday, Oct. 3 at 9 p.m. Pao, who is at home on either side of the camera (he came to the U.S. to better learn English for his film producing career in his native Taiwan), cooks a Mosa favorite with host Ali Khan: Rainbow Panang Curry Chicken. Mosa Scores High with Cooking Channel Appearance! We are excited to (finally) announce that Mosa Asian Bistro will be featured on Cooking Channel's Cheap Eats next Wednesday, October 3, 2018 at 9:00PM CST. 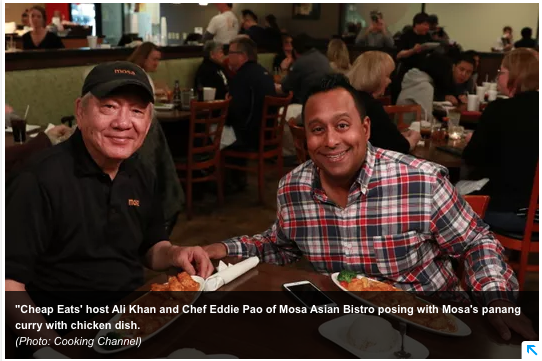 Check it out live or set your DVR to see Mr. Eddie and Cheap Eats host, Ali Khan, serve up our Rainbow Panang Curry Chicken. Vote MOSA Best of Memphis 2018! The Memphis Flyer's Best of Memphis Poll 2018 is open now through August 23rd 11:59pm central. in the categories for Best Chinese and Best Thai. Thank you for your continued support. Wishing everyone a happy fourth! 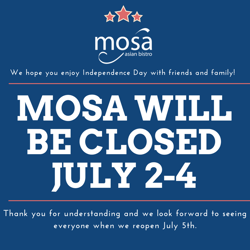 Mosa will be closed July 2-4, 2018. 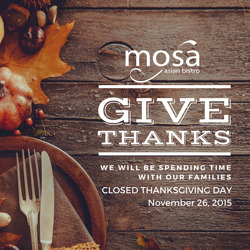 Mosa will be CLOSED today, as we are each Monday. We will honor those who gave the ultimate sacrifice for our great country today and every day. We'll see you all tomorrow! 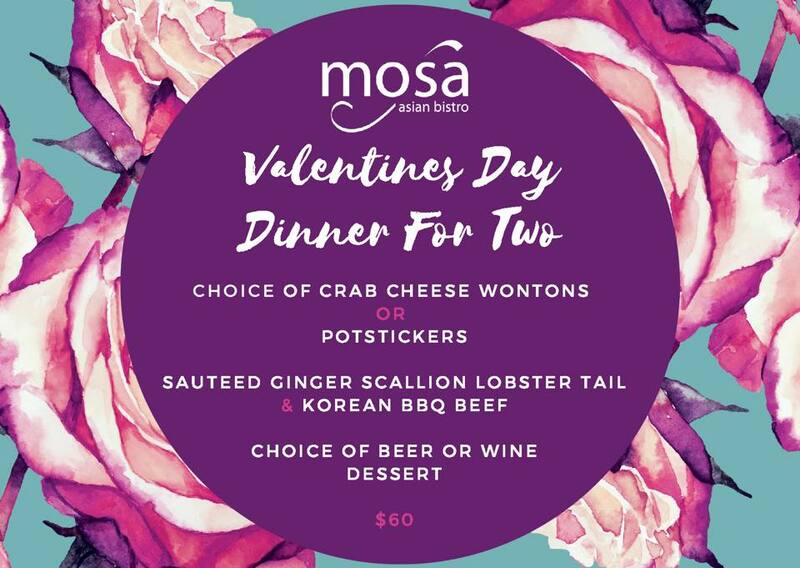 Enjoy a Surf 'n Turf Valentine's Dinner for Two at Mosa! Happy Valentine's Day! Please join us this evening for our Surf 'n Turf Valentine's Day Dinner for Two! No reservation necessary. Come on in! It's the Year of the Dog! 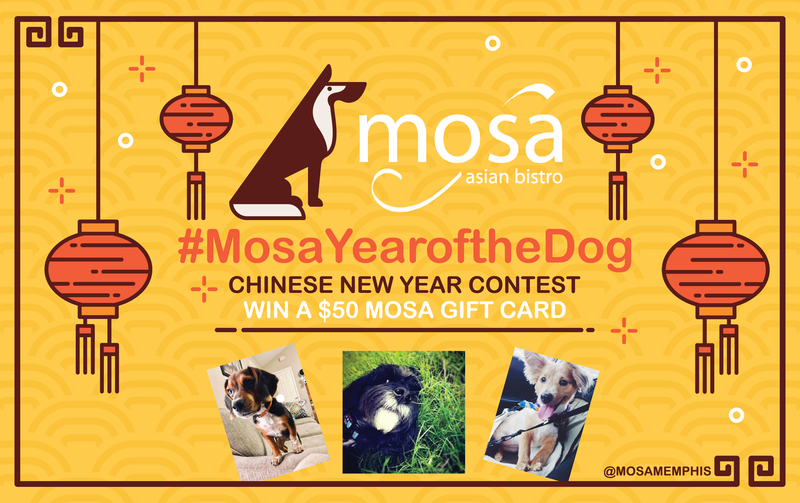 Check out Mosa Asian Bistro this Thursday for the full details of our Chinese New Year Contest and your chance to win a $50 Mosa Gift Card. Do you wanna build a snowman? We will be closed today for lunch but will continue to monitor the weather and let everyone know if we will reopen for dinner. We will be closed today for lunch but OPEN for dinner beginning at 4:30pm. Oh the weather outside is frightful! 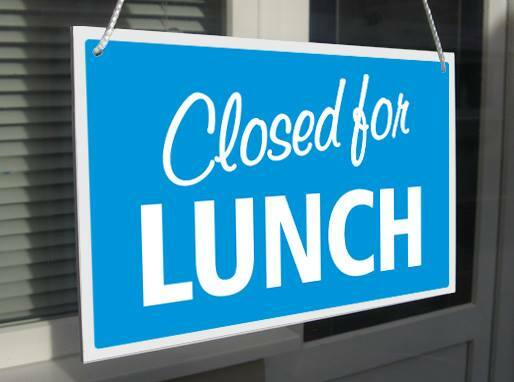 Mosa will be closed for lunch today, Friday January 12th. We will be monitoring the roads and conditions and will let everyone know if we will open for dinner this evening. 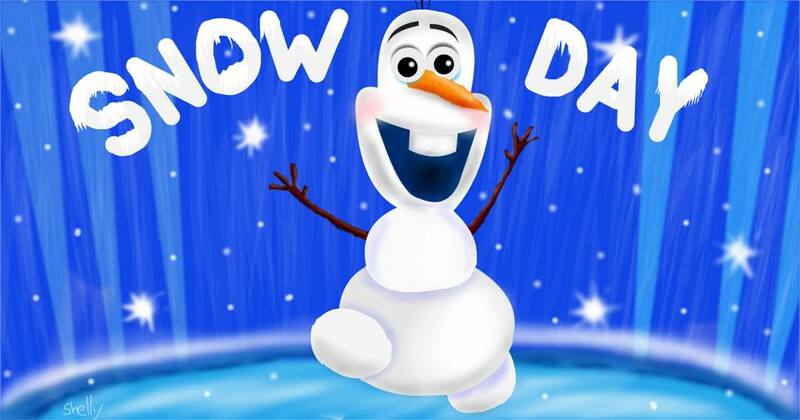 Stay safe and enjoy the snow! Use CYBER5 today when buying tickets for Female Warriors: Armed and Delicious' 3rd annual Giving Tuesday event benefiting the Women's Foundation for a Greater Memphis and get $5 each ticket. Join Mosa Asian Bistro and the Female Warriors: Armed & Delicious for our 3rd Annual Giving Tuesday which will benefit the Women's Foundation for a Greater Memphis. Cocktails and food will be served from 5-7pm next Tuesday, November 28th at Felicia Suzanne's, along with the musical stylings of Southside Supper Club. Then we will send guests away with a "swag bag" that will make your sweet tooth dance! Participating restaurants include Mosa Asian Bistro, Felicia Suzanne's, Central BBQ, Andrew Michael, Alcenia's, Bedrock Eats & Sweets, Muddy's Bake Shop, Sweet Potato Baby, Cooper Street 20/20, Whimsey Cookies, Katie's Kitchen, Fork It Over, The Pink Bakery and Nothing Bundt Cakes. Tickets are $40 individual/ $75 couple in advance and $40 at the door. Buy tickets now at Eventbrite. By far one of my favorite past times is exploring cities and finding new little nooks and places that will create lasting memories in both my mind and my palette. Food exploration--- yes that's a term I just came up with is one of my newest loves. I think I'll pitch a show to a television network lol. Seriously though, last Friday I took a half a day off and drove to East Memphis to Mosa Asian Bistro for lunch. L I T E R A L L Y, I was in for an asian feast. A total feast in food and memories indeed were made. A total feast in food and memories indeed were made. As soon as I walked through the doors , I was greeted by Michelle and her dad owner of the restaurant--- how cool, casual and personal. Apparently from their insane and loyal following all of the patrons of the restaurant feel that way. Mosa Asian Bistro has the feel of a neighborhood bistro with the most amazing Asian food ever. The menu is totally customizable and gives you the options to add or take away what you like. Great news for vegans and vegetarians --- Mosa is known for having an array of dishes catered to you as well. Out of all of the food I was served, I ate some of it all. Every S I N G L E dish was delightful and fresh. 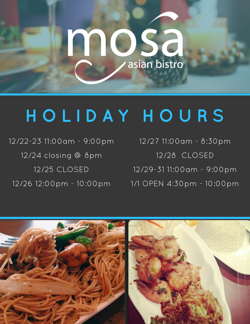 Mosa Asian Bistro is now one of my favorite local eats and worth a weekly visit. You all, please, do yourself a favor and go see Michelle and her Dad and the amazing staff at MOSA. You'll thank me. Memphis is not only a great city for fine dining, it’s also chock full of restaurants offering incredible food at amazing prices. On the hunt for cheap eats, we tapped a few of our favorite Memphis foodies to offer some of their favorite options for delicious, affordable food around town. From cookbook authors to chefs, our friends weighed in with their favorite cheap eats, and our mouths are now watering. We bet yours will, too! “I love the homemade bread, the fresh avocado, tomatoes, lettuce, and seasoned sirloin — all of my favorite things in a yummy toasted sandwich!” raves Michelle. 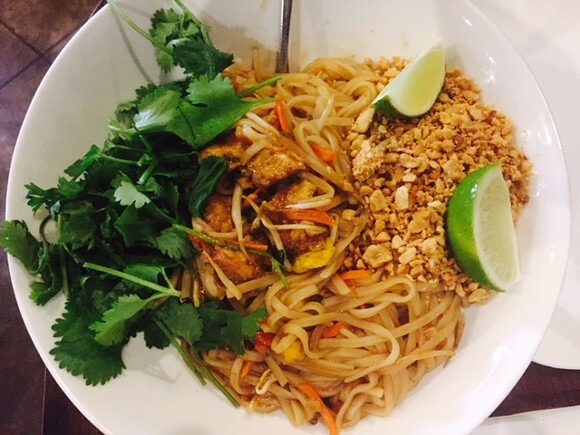 Thank you, Susan Ellis for sharing Mosa's Pad Thai dish with your readers. Everybody loves dear old Dad — but can you get too much of him? No? What if you share a 10-by-10 office with him? "It's more like a closet," said Anna Blair, who along with her sister, Katherine Riederer, has joined her father, John Vergos, at the Rendezvous. Even still, like everyone interviewed for this story, the pros of working for Dad in the family restaurant business outweigh the cons by far — and Dad feels the same way. "I can truly say that these last 10 years, working with my kids, have been the most rewarding of my career," said Dimitri Taras, the patriarch of the clan that runs Jim's Place Grille. Alex and Michelle Pao, children of Mosa owner Eddie Pao, are energized by him; Eric Vernon at the Bar-B-Q Shop says working with father Frank has created a better relationship between them, and Jonathan and Pepe Magallanes at Las Tortugas Deli Mexicana are a true team. Eddie Pao was a filmmaker in Taiwan for 12 years, and he came to Memphis to join his sister Cindy so he could work on his English; he planned to return within a year. But a year later, he, Cindy and brother Alfred opened Formosa. At one time there were three locations; the one remaining now was sold to the longtime chef and is no longer in the Pao family. In 2004, Eddie opened Mosa in Germantown; the fast-casual restaurant featured some Formosa items but many other dishes, too. "I think it says so much about his talent that he could go from only knowing Chinese food to serving other Asian cuisines," said son Alex Pao, 32. "People tell us all the time that his pad Thai is the best they've ever tasted." The creativity that led Eddie to filmmaking is unleashed in his kitchen. "He is always pushing, and he has a passion and a joy for food and what he does," said Michelle Pao Levine, 40. "He makes over 22 sauces himself, things that he comes up with. "In the Asian culture, respect for your elders is a big deal, but with him, it's just so easy. It's an honor to be with him every day. It's so important for him that we learn from others — he's always taught us that — and we learn the most from him." "It's good to learn from others," Eddie said. "But then you put in your own ideas and make it better. I tell them that, and that is what I have always done. And I tell all of the other kids who work here for me the same thing." Michelle is a big fan of how he works. "He listens to us, and if we convince him we should do something, he'll say, 'OK, I'll support you, even if it's not the best choice,'" she said. "He won't say it's a bad choice, just not the best one. But knowing that we have his support means everything." 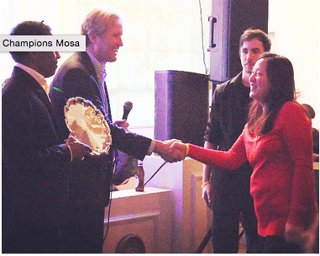 Mosa Named A Serving For Tennis Champions! A Serving for Tennis was a huge success! 300 people gathered in the Cadre Building downtown and enjoyed delicious food from 15 Memphis restaurants, bid in the silent auction, and danced to live music from the Dantones. Chris "Birdman" Anderson, the Grizz and the Grizz Girls made an appearance. Guests voted Mosa Restaurant's Asian Pork Slider the favorite dish of the evening, making Mosa Asian Bistro the " A Serving for Tennis Champion!". Thank you to our co-chairs, Dave Joerger and Kara Joerger, Kevin and Haden Kane, Brian Bendersky and Anne Wulff, The Dantones, event sponsors, volunteers, and attendees who made the evening a huge success! A special thanks to Sherri Nischwitz, Sharon Dertien, and Karen Franklin, who helped plan and host the event. To see a complete list of sponsors and donors, please visit our website. 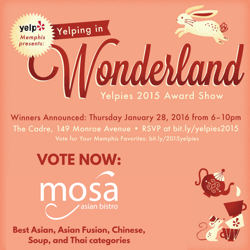 Thank you, Yelpers for naming Mosa Asian Bistro your favorite ASIAN, PAN ASIAN and SOUP in the 2015 Memphis Yelpies. When I told my colleague, Brad Vest, I was going to try the ribs at Mosa Asian Bistro, he said, "Just what this town needs. More ribs." Well, Shanghai ribs aren't those hefty, smoky ribs slathered in thick barbecue sauce. They're savory, delicate with a hint of sweetness. "No way you can compare these to the Memphis style barbecue," said Alex Pao, one of Mosa's owners. "This is its own separate beast." Pao described the pork baby back ribs, which they call "Shanghai ribs," as "Taiwanese Chinese comfort food at its finest. Rustic, but delicious." Shanghai ribs are Mosa owner Eddie Pao's take on hong shao rou, which is "red cooked pork," but they're not anything like those ribs found on numerous Chinese restaurant buffets. "Dad put his spin on it," Alex said. The ribs are cooked in a gravy with a soy garlic base. "They're slow cooked and braised in this giant wok for two and a half to three hours," Alex said. They're served with a succotash made of beans sprouts, scallions, asparagus, potatoes and diced carrots. The succotash "complements the savory flavor of the ribs," Alex said. The dish comes with a side of white or brown rice. "We add a little of the rib gravy on top of it to give it flavor. "The recipe was handed down from his mother's mother, Alex said. His mom served the ribs at family dinners at Thanksgiving. They found their way to Mosa's menu a week after Eddie brought them to the restaurant for a Thanksgiving feast for employees. They urged him to put them on the menu, said Mosa sous chef Richard Adams. Mosa also serves beef or pork Asian Seoul Sliders. They come with cilantro and Asian slaw, which is made with daikon and pickled carrots, topped with aioli and served on a toasted challah bun from Ricki's Cookie Corner & Bakery. They're fabulous. 2015 Memphis Yelpies are LIVE! Sixteen women, mostly chefs and restaurant owners, in the Memphis food industry, took part in the first Female Warriors: Armed and Delicious event held Dec. 1 in the Brinkley Plaza lobby next to Felicia Suzanne's restaurant. Cuisine included chicken and waffles from Brandi Marter of Bedrock Market & Cafe and rainbow panang curry from Michelle Pao Levine at Mosa Asian Bistro. Each year, ticket proceeds will benefit an organization that develops women's skills and confidence. The Women's Foundation for a Greater Memphis was this year's beneficiary. 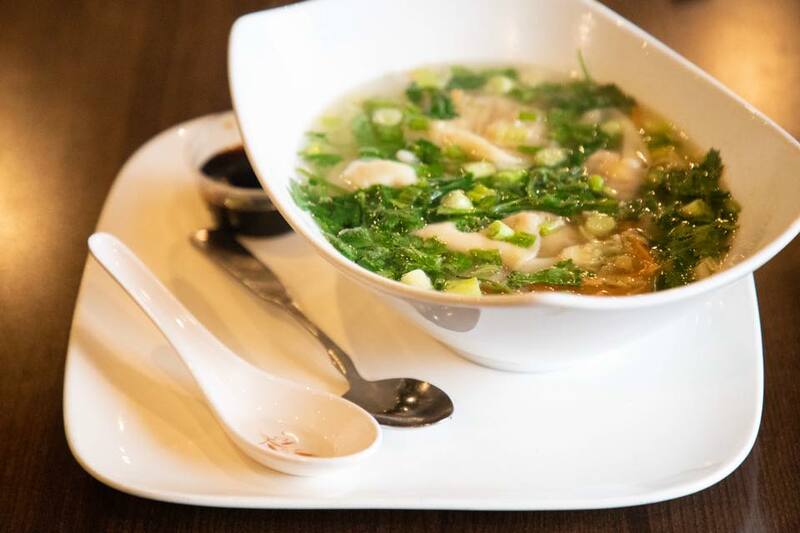 A special shout out to Jennifer Biggs and The Commercial Appeal for listing Mosa's Yuan Bao (chicken dumpling soup) as one of the 100 More Things To Eat in Memphis Before You Die. Read the full list here. 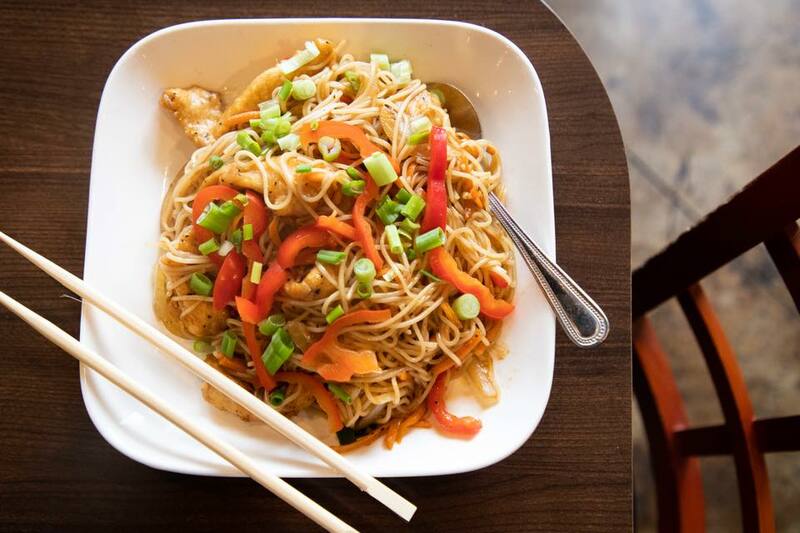 If you work and live in East Memphis, you've probably already fallen in love with Basil Rolls and Rainbow Panang Curry at Mosa Asian Bistro, but if you haven't, then today's the day to head over to the restaurant for an award-winning Asian fusion dinner. Pair the Korean BBQ Beef with Thai Calamari and Crab Cheese Wontons for a gastronomic tour around East Asia. 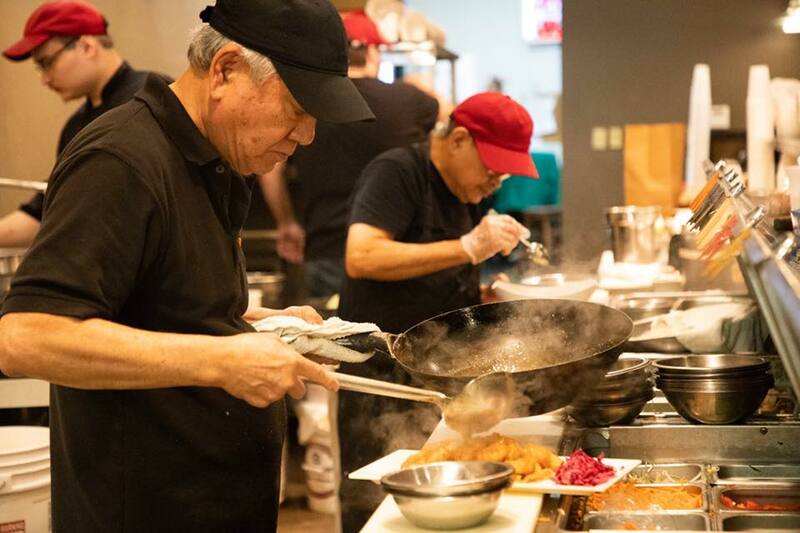 The restaurant was started by the brothers Pao, who opened their first Chinese restaurant in Memphis in 1979, two years after emigrating from Taiwan. 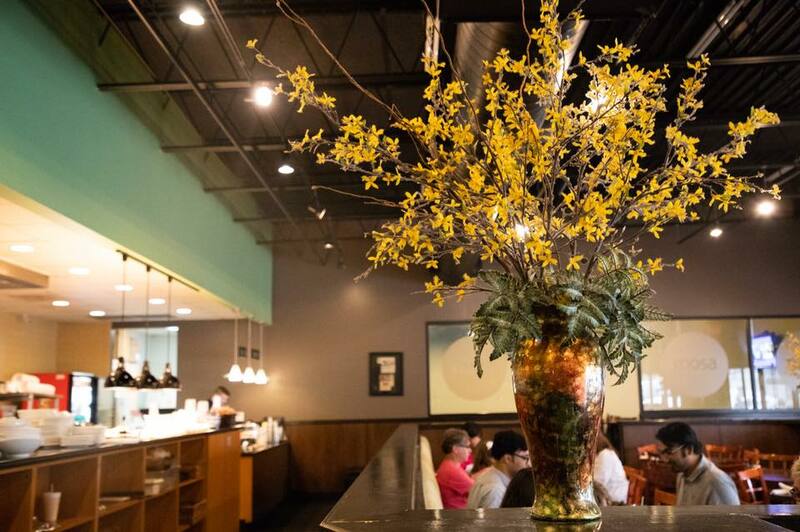 Their first restaurant, Formosa, has won Memphis Magazine's Best Chinese award for 19 years in a row. 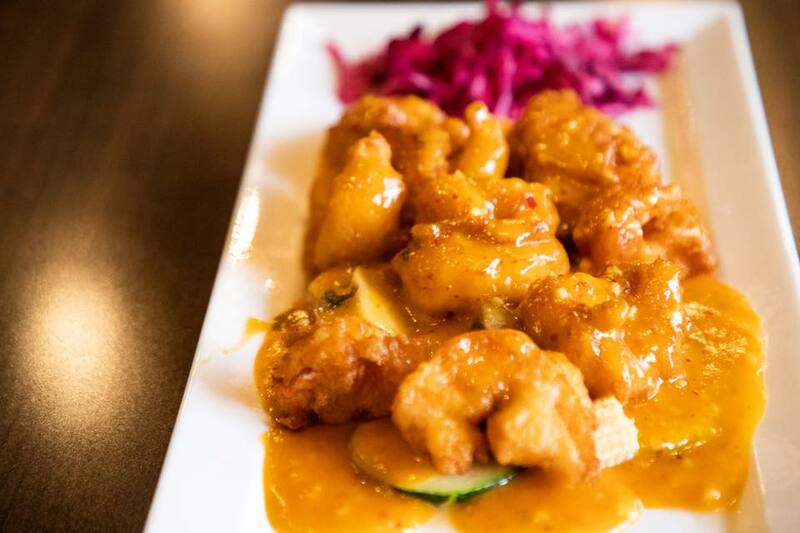 Their second restaurant, Mosa Asian Bistro, fuses Chinese food with Thai, Korean and Japanese flavors, allowing the Pao family to experiment with staple recipes from all over the continent. 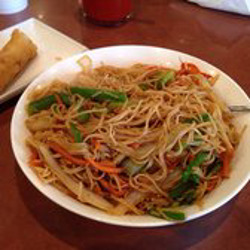 Mosa Asian Bistro is located at 850 South White Station close to your East Memphis property. They're open for lunch and dinner Tuesday through Sunday. They cook to order, and lunch is the busiest time, so call (901) 683-8889 to order ahead. Gluten-free and vegan options are available. And their customized full-service catering is available if you live in East Memphis and are throwing a party. For a full menu, visit the restaurant online. Whole hogs took center stage at Vin-A-Que, which was held Oct. 2 at Memphis Brooks Museum of Art. Hogs were still cooking in pits on the patio in front of the museum when guests arrived at the event, one of the museum's Memphis Food + Wine fundraisers. Johnny Lawrence from Sweet Grass added "mojo sauce" after barbecue lovers served themselves pork carved from the hog at the booth headed by the restaurant's chef/owner, Ryan Trimm. The tangy sauce included Cuban sour oranges, onions, garlic, cilantro and olive oil. Chefs from Restaurant Iris, Andrew Michael Italian Kitchen and Hog & Hominy also cooked hogs. Overhearing the words, "I could eat barbecue every day," Nico Zorbino added, "In the right city." Memphis, obviously, is one of those cities. Guests ate barbecue from local restaurants that included Mosa Asian Bistro, Central BBQ, One & Only BBQ, Payne's Bar-B-Que, The Barbecue Shop, Corky's BBQ and Hi-Tone/Hi-Que BBQ. "I'm porked out," said LeRoy Best, who, at that point, had sampled barbecue from four of the stations, according to Paula Diana, who was with him. Former Memphian Rob Baird, who now lives in Austin, Texas, provided the music, including originals from his upcoming CD "Wrong Side of the River." "We made it in a garage in Texas," Rob said. The CD is slated to be released in March, but the single "Ain't Nobody Got a Hold on Me" is out on iTunes and Spotify. "It's kind of a Delta blues stomp kind of thing," Rob said. "Kind of back to the Memphis days, to be honest." Thank you to I Love Memphis blog and Holly Whitfield for listing Mosa's Banh Mi sandwich as #8 and Mr. Eddie's Favorite Noodles as #64 in 100 More Things To Eat in Memphis. Read the full list here. 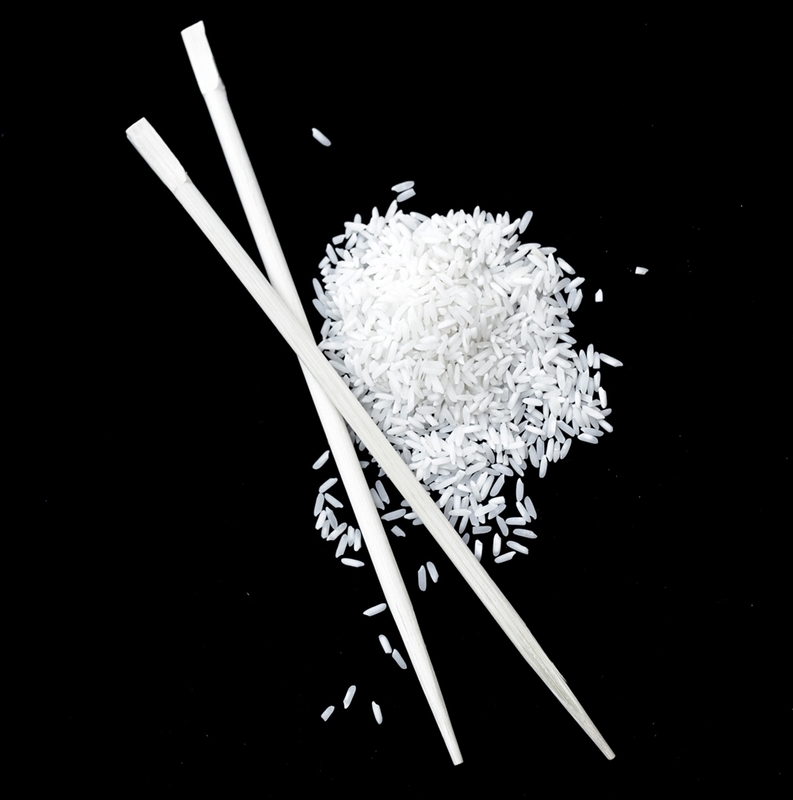 The world's cuisine is well represented here in Memphis, and Asian fare is no exception. If it's been a while since you've jumped face first into a skillet of bibimbap or some tasty teriyaki, take a gander below. What Do Labor Day, Mondays and Renovation All Have In Common? The fall season has always been a time for change. In the south we celebrate a break in the hot weather, kids going back to school and the long anticipated reveal of football season. 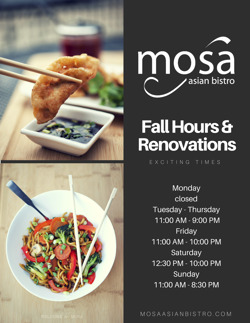 At Mosa Asian Bistro, we have a few of our own changes to celebrate this fall. - We will be closed on Sunday, September 6th and Monday, September 7th for the Labor Day Holiday. - We will be closed on Mondays beginning September 14th to allow our Mosa family sufficient time at home with their families. - You may notice some physical changes taking place over the next month. We are making some renovations and improvements to the restaurant, so please forgive our mess. 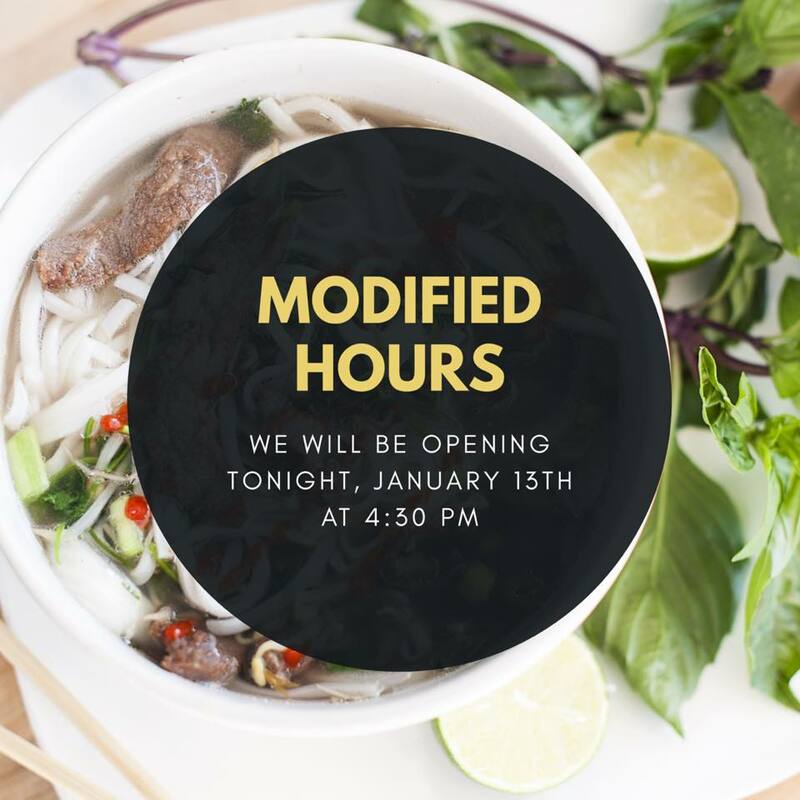 We will be open during normal business hours, so please come see us for lunch or dinner during this time. Thank you for your continued support of Mosa. We look forward to serving you soon. This was my first time at Mosa Asian Bistro, and it was quite the memorable visit. They just rolled out a summer sandwich special last week, so I had to try it. It’s called the Banh Mi ($9) and you can get it weekdays during lunch. It’s Mosa’s very own specially marinated pho beef in a Korean BBQ sauce with a fried egg, pickled Asian slaw, cilantro, and a sriracha and aioli sauce all on a toasted Ricki’s Cookie Corner challah bun. The sandwich is served with the chef’s choice of a seasonal summer fruit salad.On the first bite you get a hint of spiciness right away. There’s a lot of flavors and textures going on, but in a great way. The softness of the bun is so nice, especially when the crunchiness of the pickled Asian slaw kicks in with it. Now let’s talk about the Korean BBQ sauce. I don’t know how it’s made but… give me more of that sauce! It’s pretty much a light BBQ sauce and it was delicious. 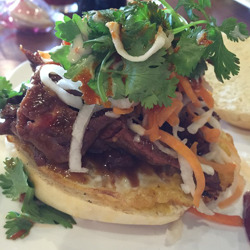 The pho beef is tender and the pieces are thinly placed on the sandwich. It’s delightful to eat this way. My mouth isn’t overwhelmed with chunks of thick beef. I must admit, I thought this sandwich was going to be heavy. Not at all. It was light, yet very filling. I didn’t taste the fried egg until I was more than halfway through the sandwich and it was a yummy, creamy surprise. I can’t decide what my favorite part of this sandwich is. The beef alone would be great by itself, but I’m so glad that Mosa Asian Bistro came up with this fusion creation! The fruit salad was pieces of mango and fuzzy white nectarines. It was juicy and extremely fresh. I gobbled it up. Sometimes, the chef will mix it up and give you plums!There wasn’t one piece of the sandwich left on my plate. I don’t know who was more satisfied... me, who did all the damage… or the owner Mr. Eddie, who personally made my sandwich. We were both smiling ear to ear. 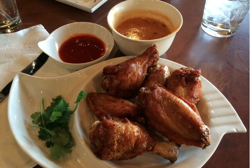 Mosa is known for its delicious Chinese and Thai food, but some of the best wings in the city can also be found on the menu. The Rainbow Wings feature a Panang Curry dipping sauce that includes fresh lime, lemongrass, and panang curry. The curry is sweet, spicy, and tangy all at once. You CAN taste the rainbow. The sauce is served on the side so the wings stay nice and crisp, so what you do with the extra is up to you. Most Asian Bistro is pleased to introduce the Bhan Mi as the new summer special. 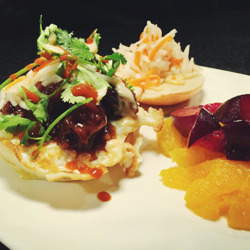 Our own specially marinated Pho beef in a Korean BBQ sauce, with a fried egg, Asian pickled slaw, cilantro, Sriracha and aioli sauce on a toasted Ricki's Cookie Corner Challah bun, this sandwich is served with a seasonal fruit salad. Please consider stopping into Mosa this week to try it for yourself! 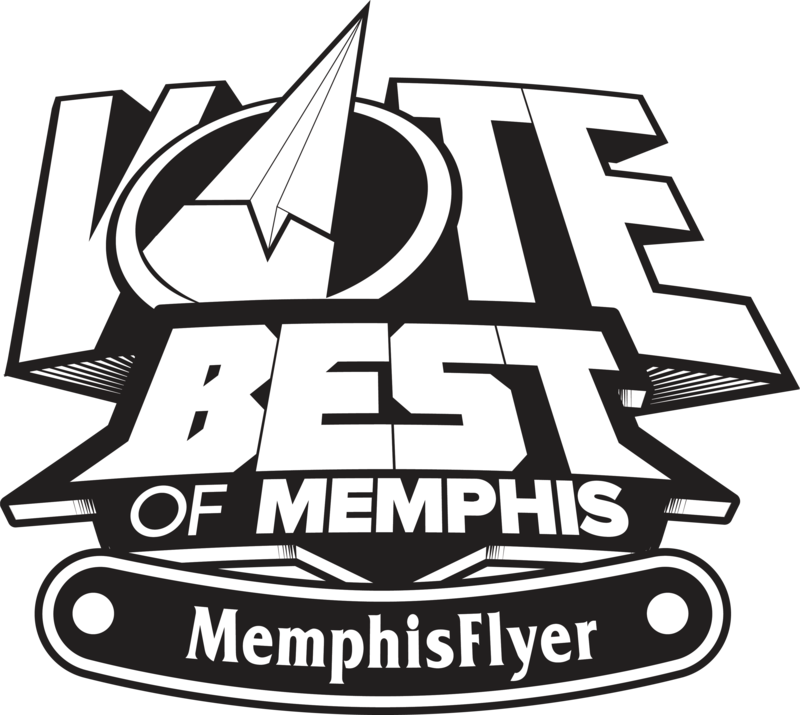 The annual Memphis Flyer Best of Memphis ballot is now open. Mosa Asian Bistro is nominated in three categories: Best Chinese, Best Thai and Best Japanese/Sushi. Please consider voting us your favorite in each category. 1. Voting is open 10am on Wednesday, July 15th through 11:59pm on Tuesday, August 4th. 2. Your ballot must have at least 50% of the categories completed to be counted. 3. One ballot per reader please. Their system only accepts one vote per device, and they reserve the right to discard any ballot they deem fraudulent. 4. Most categories have a drop-down menu of choices, and all categories have a write-in option. The drop down menus are developed by the Memphis Flyer editorial team, and are intended to help the counting process, NOT to encourage you to vote for a specific business. Please, vote your conscience and use the write-in area where necessary. Memphis Flyer Best of Memphis Issue will hit the streets on Wednesday, September 30th, 2015. Thank you for your support! Memphis, Tennessee may be dangerous ground with its tempting array of bars and restaurants serving up beer, fried foods, and classic Southern comfort food. But it’s still possible—and enjoyable—to eat healthy in this city of music. Check out some of Memphis’ healthy restaurants below. If you want to be in control of what you eat, try Cheffie’s, where you create your own meal from scratch. Put together a robust salad or flavorful sandwich from a wide selection of ingredients like grilled chicken, eggs, oven-roasted turkey, tuna salad, or walnut-apple chicken salad, paired with savory cheeses like feta, goat, parmesan, or blue. Add in veggies and fruits like roasted peppers, cucumbers, chickpeas, cranberries, sundried tomatoes, and much more for the perfect flavor. Feel like healthy Thai, Japanese, or Chinese food? You can get it all at Mosa, a bistro featuring rice and noodle bowls, curries, and more. Everything is exceptionally fresh and made to order. Expect crowds here, but it’s worth the wait. Imagine Vegan serves traditional American fare—except that the “meat” isn’t meat! Have chicken, grilled fish, and turkey in their guilt-free forms here, and come for brunch on Sundays. Another option is Two Vegan Sistas, which offers raw food dishes along with cooked vegan meals and does not use soy. It’s just what it sounds like—a restaurant that supports local farms and has fresh, wholesome offerings and a rustic charm. Enjoy salmon, chicken, steak, shrimp, and more alongside fresh salads and traditional sides. Finish off your healthy culinary experience with a heavenly treat from Mary’s, where gluten-free delights abound. Take your time with a cupcake, cinnamon roll, chocolate chip cookie, or some almond and toffee crunch (pictured at left), or bring home a buttery pound cake to share (or hide from) the family. If you recently went gluten-free and miss the days of soft, rich breads, try Mary’s banana bread, cinnamon coffee cake, or French bread, or take home some pizza crust to make yourself a pizza that truly satisfies. Memphis has a lot of affordable hot wing options, no doubt, but there's only one place for Rainbow Wings. They feature a panang curry, fresh lime, and lemongrass dipping sauce, which is a total game changer. The curry is sweet, spicy, and tangy all at once, and the wings are perfectly crispy. Hey, guess who serves hot wings? If you said “Oh, just maybe every restaurant in town,” congratulations. Winner winner, take our chicken dinner. Believe me, we’ve had enough for a while. With the Southern Hot Wing Festival and Contest coming up Saturday, it’s a good time to revisit the chicken wing, something we haven’t written about extensively in 10 years or more. But it was clearly too big of a job for one person, so we split the work four ways: GoMemphis editors Chris Herrington and Mark Richens, Michael Donahue and I each took a list and got to work. Of course, those lists grew — and grew — every time we mentioned what we were doing, because everyone wanted to tell us about their favorite place.In the end, it came down to a few things: No chains. (Sorry, Rick Ross.) No fast food. And then it came down to reputation. We couldn’t possibly go everywhere — literally hundreds of places serve wings — so we narrowed our list down to about 40 places known to be good and picked our favorite 20 of those. Did we miss something? No doubt we did, but we’re going to count on you to weigh in at gomemphis.com and tell us your favorites. Here’s our list, in alphabetical order. Hope you have your Wet-naps ready. The Memphis food scene and spring temps are an unbeatable combination. And frankly, outdoor dining is one of the best ways to enjoy local cuisine this time of year. Many of your favorite restaurants have welcoming patios for days when the weather is just right, and we’ve compiled a solid list here to get you started. Mosa Asian Bistro850 White Station • (901) 683-8889 • mosaasianbistro.comFeel at home on the patio at Mosa Asian Bistro. 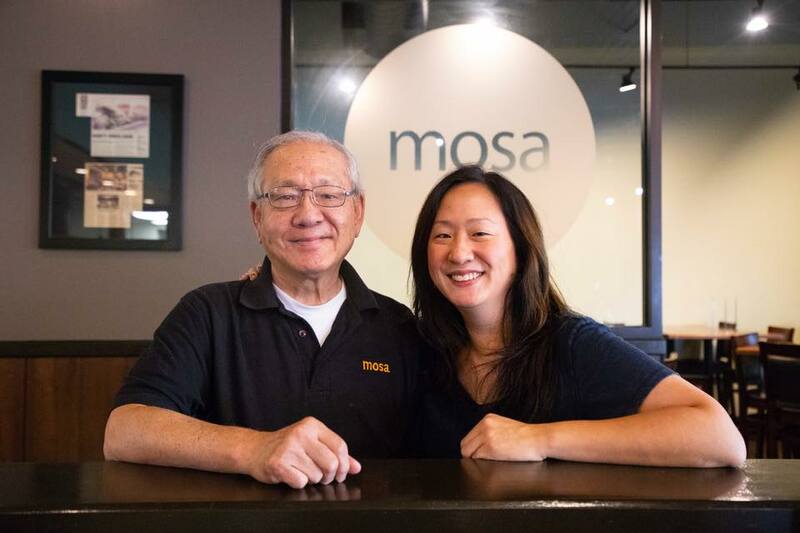 Michelle Pao Levine and her father, Eddie Pao, are co-owners of Mosa. This restaurant recently made national foodie news in an article, “The Best Chinese Food Restaurant In Every State.” In it, Mosa was named Memphis’ No. 1! 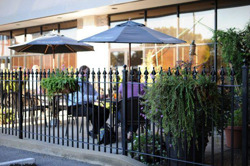 Enjoy your delicious meal on the patio, which is enclosed with a lovely wrought-iron fence with greenery. For a full list of Memphis' best patios, click here.